In this course you will diver deeper into the world of marine biology. This course follows on from Marine studies A, and is an excellent opportunity to expand your knowledge of a broad variety of marine organisms. It contains a range of expertise that will boost the rewards for those seriously interested in the marine world of their hobby or career-linked pursuits. Divers, Fishermen and those involved in Marine Tourism will find this course specifically useful. You will learn about the many types of marine organisms, focusing mostly on Protists, Sponges, Marine plants, Cnidarians, Worms, Arthropods, Molluscs, Echinoderms, Non Bony Fish, Bony Fish and selected Marine Mammals. Additional study paths would include conservation and environmental management, wildlife conservation, zoo keeping and tourism related courses such as adventure tourism, tourism A and B, eco tour management and eco tour guiding.  Learn about Protists, Sponges, Marine plants. 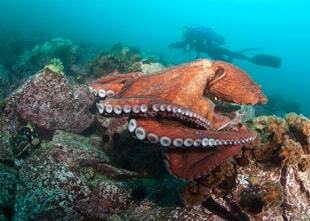  Learn about Cnidarians, Worms, Arthropods, Molluscs.  Study Chinoderms, Non Bony Fish, Bony Fish and selected Marine Mammals.